Bi-fold Doors - Woodgrain’s bifold doors are crafted with state-of-the-art technology to ensure consistent precision assembly. Bifold doors are ideal for smaller spaces, including closets, laundry rooms and any area where space is at a premium. Bifold doors come with all the necessary hardware for installation. Café - Woodgrain’s Café doors admit light and ventilation, and provides minimal privacy. The Café door comes as a pair and swings open – in and out – in both directions for easy flow. Craftsman Doors - Make a memorable first impression with a Woodgrain Craftsman Door. The collection of exterior doors is built with unsurpassed craftsmanship and extensive design and glass options offering natural warmth and beauty to your home. All Craftsman doors are built with true divided lite construction (TDL) and Low-E glass, meaning that each pane of glass is a unique piece of glass providing better protection and easier finishing. Craftsman doors are designed to withstand exposure to all weather conditions and are available in fire-rated options. Decorative Glass - Customize your home with Woodgrain’s interior Decorative Glass Collection with geometric patterns in a variety of styles and finishes. Design Collection Doors - The Woodgrain Design Collection of medium density fiberboard (MDF) includes infinite options including personalized options with our auto-CAD technology. Available in fire-rated options. Flat Panel Doors - Woodgrain offers interior flat panel doors in a variety of wood species. Flat panel doors offer crisp lines and provide a versatile look that complements both modern and traditional interiors. Available in fire rated options. Louvered Doors - Woodgrain’s louvered doors provide a beautifully functioning door with touch of subtle charm between passageways. Designed to provide privacy and ventilation, and ideal for closets and other spaces that require maximum air circulation, louvered doors are a sensible choice for hallways, closets and storage rooms. Planked Panel Doors - Woodgrain offers interior and exterior planked panel doors in a variety of wood species. Planked panel doors offer added dimension to complement traditional and contemporary styles. Exterior doors are designed to withstand exposure to all weather conditions and are available in fire-rated options. Raised Panel Doors - Woodgrain offers interior and exterior raised panel doors in a variety of wood species. Raised panel doors offer added dimension to complement traditional and contemporary styles. Exterior doors are designed to withstand exposure to all weather conditions and are available in fire-rated options. Sash Doors - The Woodgrain Sash Door Collection includes an assortment of handcrafted doors to complement any décor. All Sash doors are built with true divided lite construction (TDL) and Low-E glass, meaning that each pane of glass is a unique piece of glass providing better protection and easier finishing. A variety of interior and exterior designs with numerous lite and panel configurations available. Each exterior option is designed to withstand exposure to all weather conditions and is available in fire-rated options. Sidelights - The Woodgrain Glass Door Collection also includes a variety of sidelights to complement any door. Adding sidelights to either or both sides of your door will increase the impact of your door by inviting natural light into the home at entry or patio doorways. Sidelights are available in Low-E single glazed or insulated options. Traditional French Doors - The Woodgrain Traditional French Door Collection includes an assortment of handcrafted doors to complement any décor. All French glass doors are built with true divided lite construction (TDL) and Low-E glass, meaning that each pane of glass is a unique piece of glass providing better protection and easier finishing. A variety of interior and exterior design options are available. Each exterior option is designed to withstand exposure to all weather conditions. 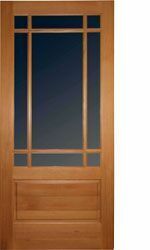 Transoms - The Woodgrain Glass Door Collection also includes a variety of transoms to complement any door. Adding a transom above your door will extend the height of your door and allow natural light into the home at entry or patio doorways. Transoms are available in Low-E single glazed or insulated options. Utility Doors - Customize your home with Woodgrain’s Utility Doors with Laundry, Pantry and Wine Cellar options in a variety of finishes.